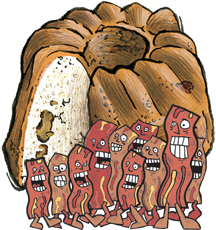 The bacon invasion continues: it has now infiltrated the most popular pastry we make, our legendary Sour Cream Coffee Cake. Chunks of apples and pieces of Nueske’s amazing Applewood Smoked Bacon are mixed with top-notch ingredients like organic flour, Indonesian cinnamon and real sour cream from Guernsey dairy in Northville, Michigan. Like the rest of our coffee cakes, it’s baked in a traditional bundt pan. Unlike our other cakes, it’s savory and sweet at the same time and a true testament to the limitless possibilities of bacon. What can't it do? Due to the perishability of the Applewood Smoked Bacon it's best to open and enjoy it as soon as it's received. Don't want to eat it right away? Stick it in the freezer where it will wait patiently until its number is called.